On Sunday 2nd November 1924, St Paul’s was officially opened with Mrs Burd listed as playing the organ, an instrument donated by her husband. Evening Post 4 November 1924. 1925 St Paul’s from Gordon Road. 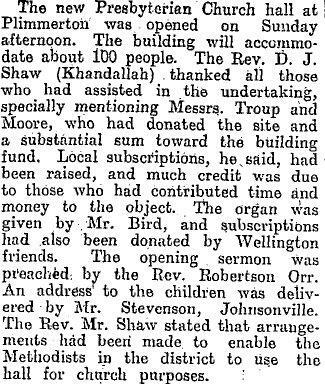 In 1926, a vestry was added to the building, the funds for this having been raised at a bazaar held by the ladies . It should be noted that at this time the entrance to the church was at the front Cluny Road-facing aspect of the building. 1950 St Paul’s Sunday school. Note: at left behind fence is the ‘long drop toilet,’ and the Cluny Road window does not have ‘St Pauls’ etched on it. 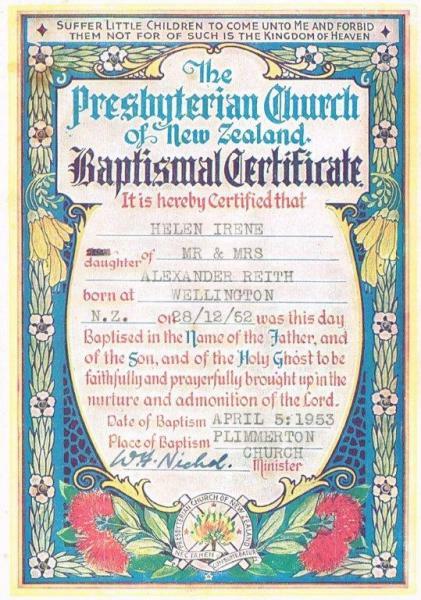 The baby boom of the 1950’s saw a large number of children being baptised at the church. There was an active Sunday school, as can be seen in this photo of a children’s day at St Pauls. 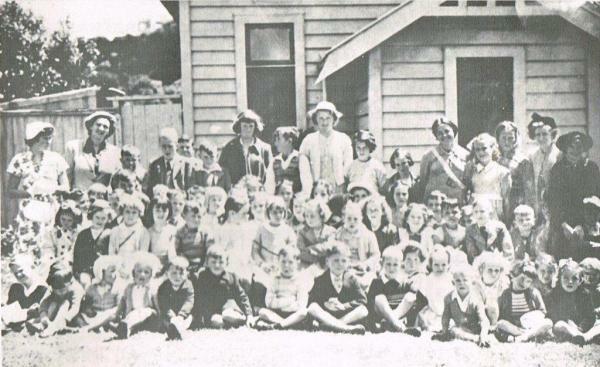 At one time the Sunday School listed 120 children and 9 teachers . There is a strong Scottish connection with a piper standing by the entry to the church. 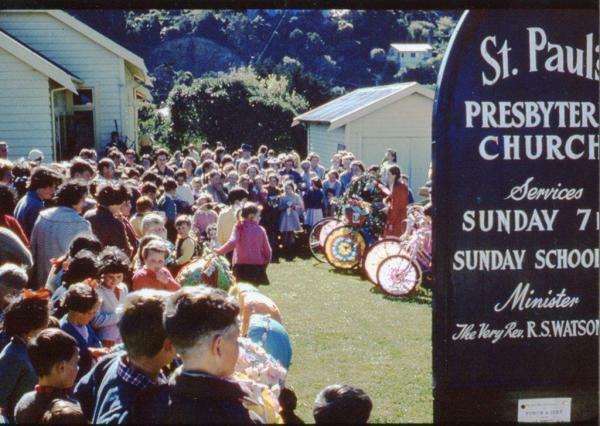 1956 Children’s day at St Paul’s. 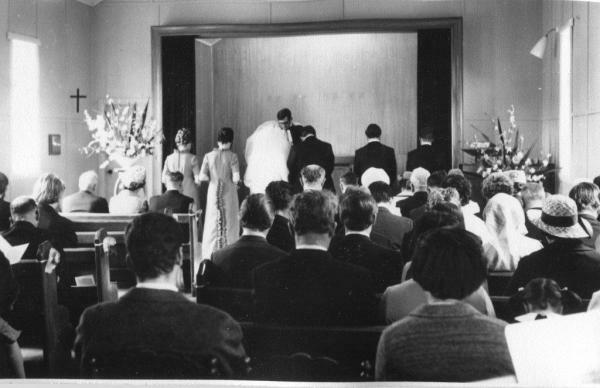 In 1957-58 St Pauls was enlarged and the Sanctuary refurbished. A magnificent communion table was donated by Mr A D Brash in memory of his late wife . 1960 St Paul’s Sanctuary at Airlie Road end. 1960 St Paul’s entrance with Rita & Ron Ewen’s wedding photo. Note: by 1960 the large St Paul’s frosted window had been added to the Cluny Road end of the building as can be seen in this photo. 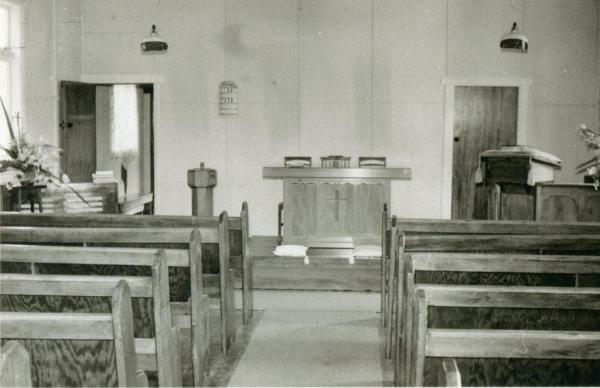 1962 saw further alterations at St Paul’s; a new sanctuary was added at the eastern end of the building and a vestibule and Sunday school built on the north side . 1972 St Paul’s looking towards Cluny Raod showing new sanctuary. 1972 St Paul’s showing the new vestibule and Sunday school area. 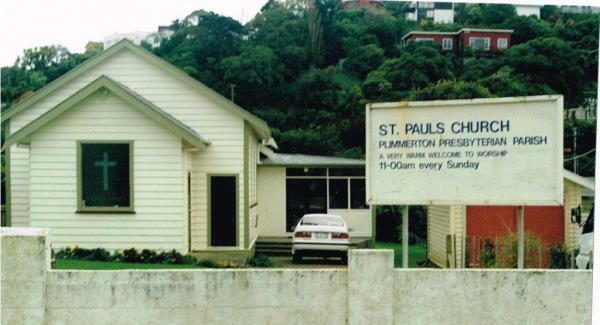 In 1974 St Paul’s celebrated 50 years. 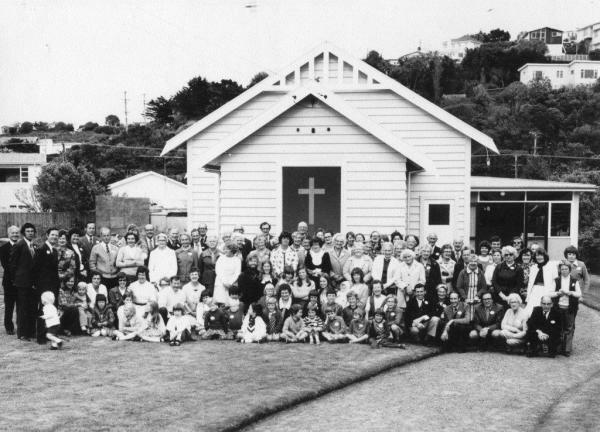 The photograph below shows a large congregation but over the ensuing years numbers declined as the neighbourhood changed. By 1999 the parish noted ‘it was a church mainly attended by retired folks’ . 1974 St Paul’s 50 years celebration. 2000 St Paul’s at the start of the new millennium. In the new millennium, the continuing decrease in numbers at St Paul’s forced the Presbyterian parish to review the viability of the church. The decision was made to close St Paul’s and on 24 December 2006 the final service at St Paul’s was held. 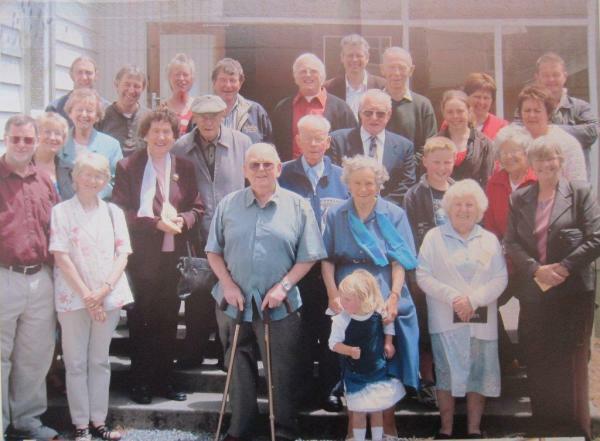 The congregation amalgamated with the St Barnabas congregation in Mana. 2006 The final farewell from the community. St Paul’s was sold 2010 and now is a private residence but the new owners have retained many of the external features. Thanks to Rita & Ron Ewen and Helen Pearson for material used in this article. 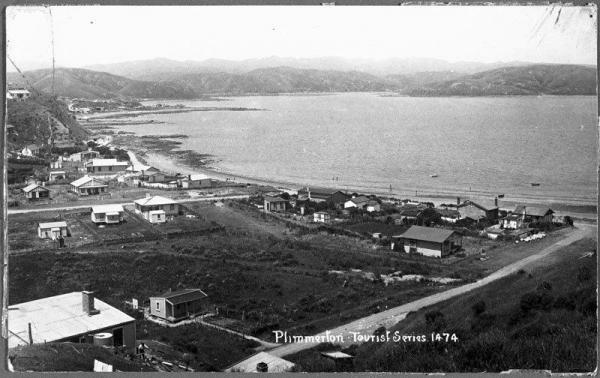 *Cameron family – Cameron’s Guest House cnr Cluny & Moana Road, article to be prepared. 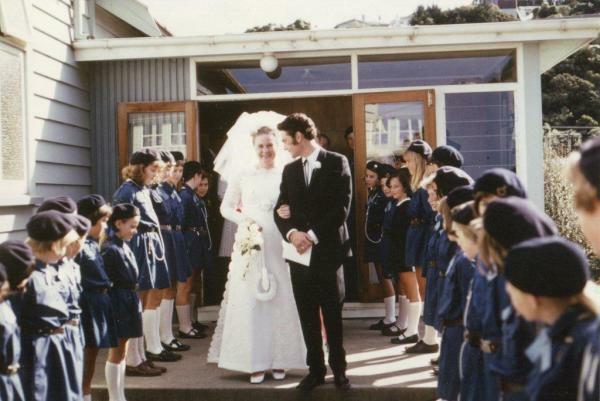 *Peter & Elizabeth Oag – 7 Cluny Road, article to be prepared. *Bennett – possibly WH Bennett, see ANZAC article on Bennett family. 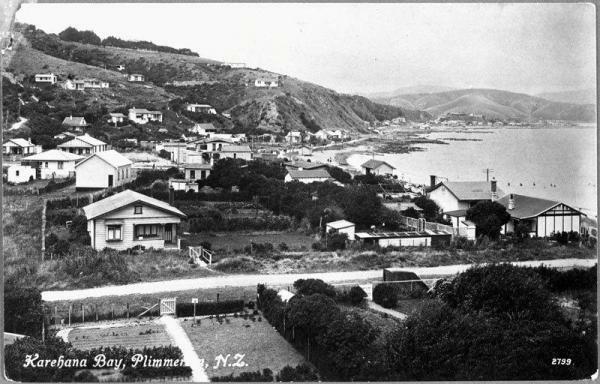 3 Cluny Road, Karehana Bay, Plimmerton.